Generously sized, reusable, noninsulated shopping bags. 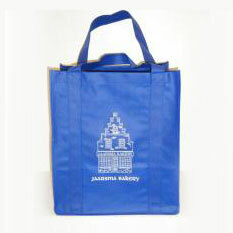 Be "green" with our royal blue large tote bags. Great for all your shopping needs. 15" tall x 13" wide x 9-1/2" deep.